RELEASE CEREMONY IN MEMORY OF 100 YEARS ANNIVERSARY OF THE GADHAR PARTY MOVEMENT. MASTER UJAGAR SINGH KHALSA AND DAVINDER SINGH GREWAL MEMORIAL AWARDS. In the presence of many Punjabi scholars and community elders, the Smagam commenced with the appointment of an Honorary Presiding Board. This was comprised of world renowned speaker Gian Singh Sandhu [Founder of World Sikh Organisation], Eminent writter Bhai Jaiteg Singh Anant [the spirit and soul of the Punjabi Adbee Sangat Literary Society of Canada], Sikhism’s well respected and dignified Dr. Davinder Singh [Akal Takhat appointed research scholar], and most respectable Jagjit Singh Thakar. 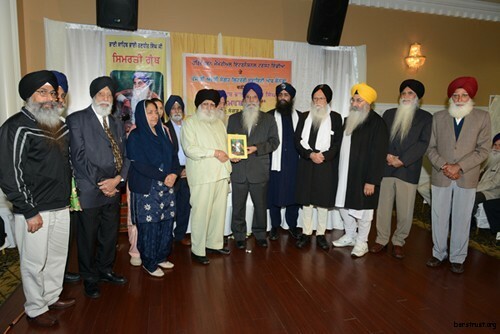 Honorary guests Gian Singh Sandhu releasing Simriti Granth along with Jaiteg Singh Anant, Dr. Davinder Singh, Jagjit Singh Thakur, and Kehar Singh Dhamret. First and foremost, Thakar Sahib approached the podium and commenced the ceremony by greeting the congregation. He then sang a poem written by Bhai Sajan Singh Narangwal [fellow Ghadar] in memory of Bhai Sahib Randhir Singh Ji. Following this Bhai Chamkaur Singh Sekhon [Sarangi Master] read very eloquently a kavita [poem] written by Hira Singh Dardh. The Editor of the Simriti Granth, Bhai Jaitegh Singh Anant gave a speech on his vision for the creation and purpose of the Granth. This Simriti Granth is something extraordinary as it is compiled of numerous articles on Bhai Sahibs life written by eminent University scholars and historians from around the world particularly India, North America, and the United Kingdom. Other notable speakers were Dr. Puran Singh (Vancouver) and Dr. Davinder Singh (White Rock). Sardar Jagjit Singh Thakar read an article by Dr. Gulzar Singh Kang (eminent scholar Guru Nanak Dev University, Amritsar). Dr. Sarbjot Kaur’s article was read by Bibi Gurdish Kaur Grewal. All of the speeches and articles were so eloquently spoken and read. Various scholars and historians have written on many aspects of Bhai Sahib’s life, from his spirituality to his role as a Sant Sipahi (Warrior Saint). These qualities were beautifully presented. Past president of Ross Street Gurdwara, Vancouver Daljit Singh Sandhu, and Jagtar Singh Sandhu of Dashmesh Darbar, Surrey spoke about Bhai Sahib Randhir Singh’s life and the many sacrifices for the Khalsa Panth. They also mentioned that Bhai Sahib should not only be known as the creator of one Organisation, but a great leader of the Sikh Panth. Giani Narinder Singh of Gurdwara Dukh Nivaran Society and Piara Singh Nat (past President of Guru Nanak Sikh Temple) felt that Smagams like these should be held every year, and the Literary Society should be helped in setting up and funding of these projects in the near future as well. 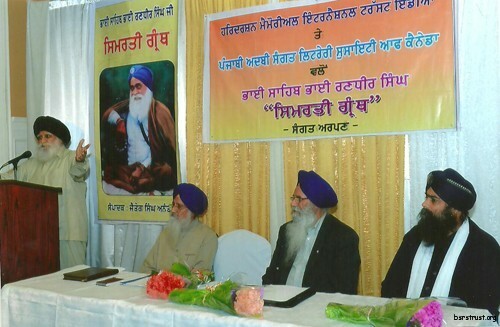 Chief Spokesperson Gian Singh Sandhu said that the Simriti Granth would change peoples’ lives morally and spiritually, and that the seed of faith is ingrained in all of humanity. Master Ujagar Singh Khalsa first met Bhai Sahib in 1947, and spoke of his unforgettable memories of times he shared in the sangat of Bhai Sahib. Bhai Malkiat Singh from Seattle, USA also spoke humbly with love about Bhai Sahib. Simriti Granth was first released by Gian Singh Sandhu after then the first copy of the “Bhai Sahib Bhai Randhir Singh Ji Simriti Granth” was presented by the Editor Bhai Jaiteg Singh Anant to Hononary Scholar Dr. Davinder Singh. Both Bhai Jaiteg Singh and Gian Singh Sandhu presented a Memorial Award to Master Ujagar Singh Khalsa (Vancouver) and Bhai Davinder Singh Grewal. They were also given a copy of the Simriti Granth, and honoured with a dastar, shawal, plack, portrait of Bhai Sahib and citation with a bouquet of flowers. Finally, Gian Singh Sandhu was presented with a shawal and dastar. 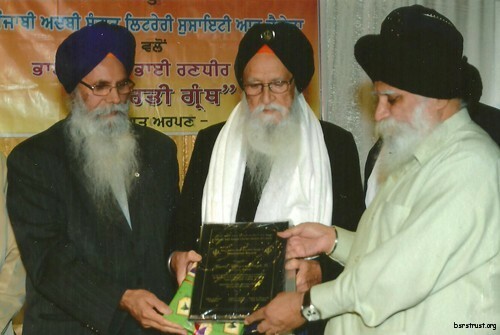 Bhai Malkiat Singh was presented with a copy of the Simriti Granth. The smagam ceremony went on for 3 hours in memory of Bhai Sahib. Some very notable individuals including eminent scholars and writers medias, and leading members of the Gurdwara organisations were: Dr. Pargat Singh Bhurji, Dr. Sushil Kaur, Professor Deep Singh Sangra, Joginder Shamsher, Gurdwara Dashmesh Darbar Surrey President Gian Singh Gill, Giani Keval Singh Nirdosh, Shingar Singh Sandhu, Kehar Singh Dhamrait, Sarbjit Singh Kooner, Keval Singh Dhaliwal, Bibi Gurbachan Kaur Dhillon, Avtar Singh Sandhu, Bhai Shaminder Singh Gill and Bhai Indermohan Singh Suty Aheer, Jai Birdi, and Raminder Bhullar. In the warm memory of Bhai Sahib Bhai Randhir Singh Ji, this historical Memorial Smagam was a great success. Editor of Simriti Granth Jaiteg Singh Anant addressing the congregation. Also seated in the Presiding Board are S. Jagjit Singh Thakar, S. Gian Singh Sandhu and Dr. Davinder Singh. 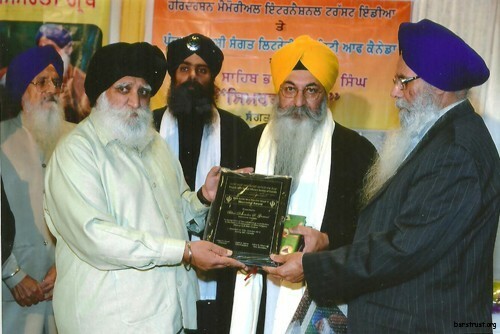 S. Gian Singh Sandhu and Jaiteg Singh Anant presenting Master Ujagar Singh with the Bhai Sahib Randhir Singh Memorial Award. Also standing in the photo are individuals from the Literary Society.